Sub-Zero refrigerators feature a tighter seal for fresher food. If you’re planning a kitchen remodel, you might be considering Sub-Zero refrigeration and wondering, “Is it really worth it?” While other brands may cost less, Sub-Zero has distinguished itself in the premium space with superior features and greater reliability. Here’s a look at what makes Sub-Zero an excellent choice for Kitchen refrigeration. Sub-Zero is a family owned company based in Madison, Wisconsin with manufacturing plants in both Wisconsin and Arizona. They are credited with creating the first professional counter depth refrigeration units. In other words, Sub-Zero was the first company to offer built-in refrigeration that did not protrude into your kitchen, and they would remain the only company to do so for some 20 years. One of the primary features that distinguishes a Sub-Zero refrigerator system from other brands is the use of two compressors. Having one compressor dedicated to freezing and one for refrigeration allows these refrigerators to outperform other brands in food preservation. It also ensures that the refrigerator’s preservation system is not overworked, thus extending its lifespan. As such, Sub-Zero refrigerators have a longer appliance life and a wider warranty coverage. Sub-Zero refrigeration comes with more tightly sealed doors to limit temperatures and keep food fresher for longer. 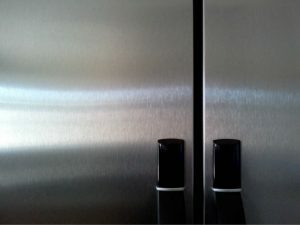 They achieve this by using heavier insulation that can prevent air from getting into the refrigerator after the door is closed. In addition, Sub-Zero systems feature a microprocessor control system that can automatically adjust temperatures to match changes in the climate. This provides users with greater control when it comes to tailoring their refrigerator’s settings to their individual needs. Furthermore, an advanced air filtration system helps keep Sub-Zero refrigerators free from unpleasant odors. Shelving units are also coated with a nanotechnology to prevent the spread of spills to other parts of the refrigerator. The final, and perhaps most significant advantage to a Sub-Zero refrigeration system is that the brand offers a vast array of widths and configurations to ideally suit your particular kitchen needs. Additionally, the refrigerators are offered with stainless steel or with custom cabinet panels, meaning a Sub-Zero refrigerator will blend in seamlessly with the colors and materials used in the rest of your kitchen. If you are starting to plan your dream kitchen, a Sub-Zero refrigeration should be a strong consideration. Looking for a new fridge for your kitchen? Kenwood Kitchens can help. Since opening its doors in 1974, Kenwood Kitchens has made a name for itself throughout Maryland as a complete kitchen and bathroom remodeling firm. With showrooms located in Lutherville, Abingdon, Columbia or Annapolis, Maryland, Kenwood Kitchens is the place for all of your kitchen and bathroom needs. We’re also featuring a special Wood-Mode savings event until December 30th. Don’t hesitate to give us a call at (800) 211-8394. This entry was posted on Friday, October 21st, 2016 at 2:37 pm. Both comments and pings are currently closed.